During Winter, I always suffer from really dry skin. I find my skin changes so much when the seasons change and it usually happens quite suddenly. Last month, I was struggling to keep my skin hydrated, even with the most intense moisturisers, masks and smothering night cream on, hoping it would work it's magic over night, but no luck! So when I saw Bobbi Brown's latest range of skincare products, I figured it could be the answer. 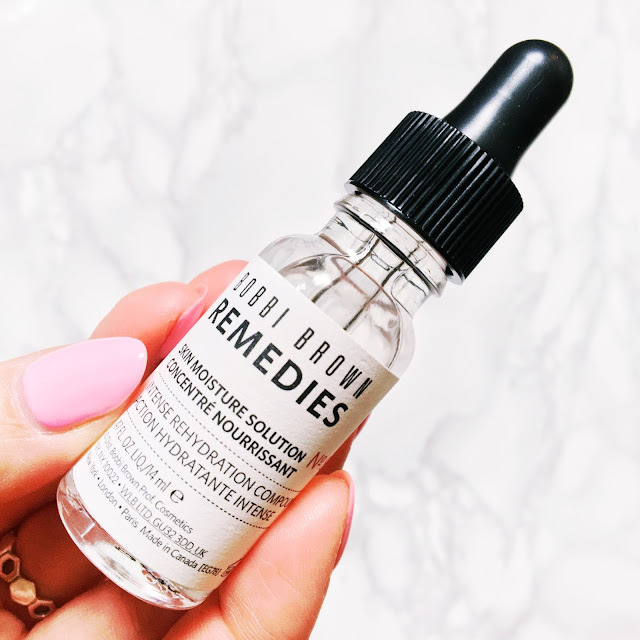 The Bobbi Brown Remedies range consists of six different solutions for a multitude of skin issues. Mine currently being dryness, I opted for the 'Skin Moisture Solution', but there are also products for problems such as pores & blemishes, loss of elasticity or redness and irritation. "A concentrated infusion of moisture, featuring a Hyaluronic Acid Complex that pulls moisture into the skin and supports skin's natural moisturising factor." Although you don't get a great deal of product (14ml), a little goes a long way. You just need a couple of drops and it glides beautifully over bare cleansed skin. It is a light gel-like consistency which does initially feel slightly sticky but that feeling only lasts a few seconds. I use this product after I cleanse my skin, and before I apply moisturiser which allows the Hyaluronic Acid to work it's magic. I have heard mixed reviews of this product but I really do feel like this product has made a difference to my skin. At £29.50 a pop, it's definitely not a bargain product but if you're suffering from dry skin, that no amount of moisturiser will cure, then give this a go! Have you tried this product yet or any of the other products in the remedies range? Let me know!